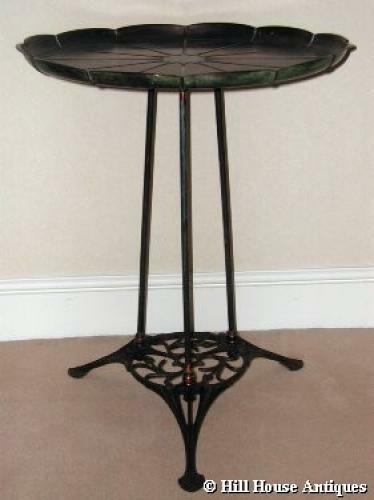 A superb and extremely RARE very well patinated large copper top table supported by three rods on art nouveau cast iron stand by WAS Benson circa 1895 (stamped Benson marks to underside). The table top is in his classic ribbed lily pad form and measures some 23" across. Height of table approx 28". Benson registered the design of this tray in 1894 - the whole table appears in one of his catalogues from 1899-1900 (pl 26 No 480A). A similar example was exhibited in 1972 at The Royal Academy of Arts in London, part of the Handley -Read Collection, in which the table was also inscribed and dated 9th July 1896.